Successfully Added NO.1 F2 Outdoor Bluetooth Watch - IP68, Pedometer, Thermometer, Altimeter, Stopwatch, App Support, Call Reminder (Green) to your Shopping Cart. The NO.1 F2 Bluetooth watch is the ultimate outdoor gadget for all sport and fitness enthusiasts. Featuring an abundance of health and fitness features, this sports watch keeps you fit and supports you to reach your future fitness goals. Its rugged IP68 design makes it fully resistant against water, dust, and drops – allowing you to use it within the toughest of environments. Whether you’re into hiking, skiing, or motor cross – this smart watch will never let you down. 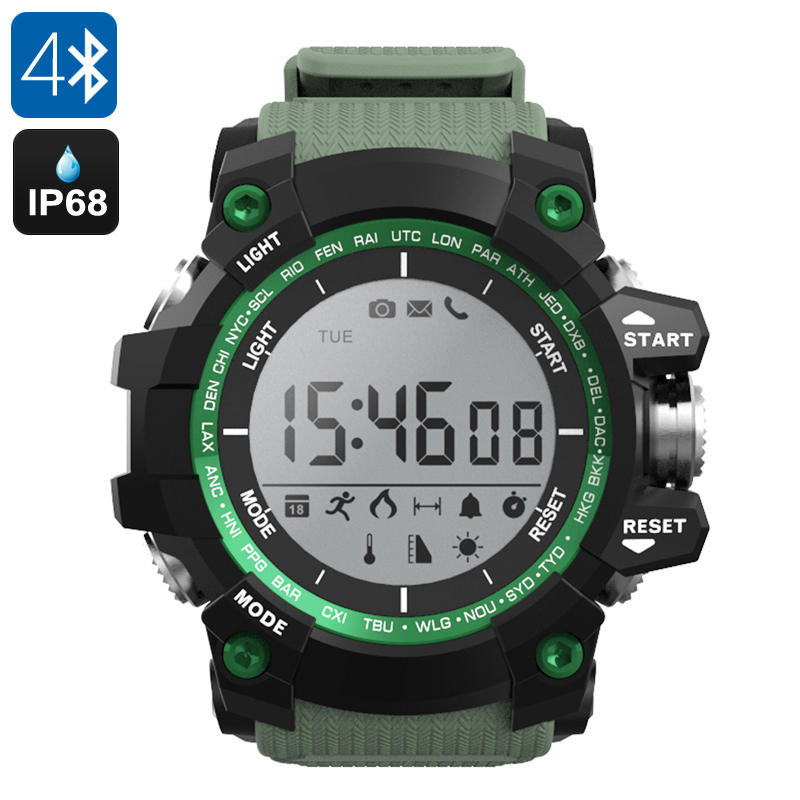 When paired with your smartphone, this Bluetooth watch additionally provides you with real-time updates on incoming phone calls, messages, and social media notifications – ensuring that you’ll never miss an important call again while out in the wild. With its sophisticated pedometer, this outdoor gadget keeps constant track of the duration of your workout, the distance covered, the number of steps taken, and the calories burned. With access to all this information, you will be able to keep track of your previous exercise sessions and adjust your upcoming ones accordingly. Besides its pedometer, this Bluetooth smart watch furthermore comes with an UV meter, thermometer, altimeter, stopwatch, and calendar. Thanks to all these features, the NO.1 F2 Bluetooth watch is the ultimate sports watch that supports the needs of anybody out there. Packing a bright 1.1-Inch display, this smart watch constantly provides you with clear real-time exercise information. When paired with your smartphone, this outdoor gadget is furthermore compatible with its own mobile application – allowing you to efficiently track your data and analyze exercise reports. Additionally, it also features an advanced sleep monitor feature, ensuring that you’ll get the rest needed in between workouts and recover as soon as possible. Featuring a long-lasting 550mAh CR2450 button battery, this Bluetooth sports watch will get you through two years of workout without needing to worry about running out of juice. The NO.1 F2 Bluetooth Watch comes with a 12 months warranty, brought to you by the leader in electronic devices as well as wholesale electronic gadgets..